Interior, Proceed into Rogers Place up two flights of stairs into Ford Hall. The painting pays respect to the land area where Edmonton is located, highlighting the colours of beautiful sky, the stories of the area, and clear waters from far away mountains. The white areas depict the coverage of the winter snowfalls and also the many days of clear skies. Eventually by spring all the snow will melt away. Then comes spring weather, delightful flowers, and farming begins on new life surrounding the city. When the beautiful blue skies become covered with rainy clouds they bring a refreshing blessing to the earth life of plants, and other living things flying or living on the ground. Stunning river valley scenery adds more beauty to the area. All roads lead to the area, Edmonton, as it is a central destiny for all who came before, and who came after. – Alex Janvıer, February 25, 2015. 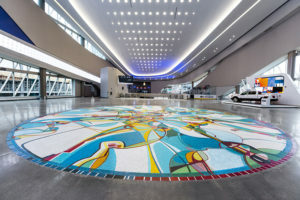 Biography: Alex Janvier was born in 1935 and is of Dene sųłı̨né and Saulteaux descent. At the age eight, he was sent to the Blue Quills Indian Residential School near St. Paul, Alberta. Janvier speaks of having a creative instinct from as far back as he can remember, and says he was given the tools to create his first paintings at the residential school. Unlike many Aboriginal artists of his time, he received formal training and graduated with honours from Calgary’s Alberta College of Art in 1960. Immediately after graduation, he took up a post at the University of Alberta. Janvier’s style is highly distinctive and involves an eloquent blend of abstract and representational images with bright, often symbolic colours. As a First Nations person emerging from a history of oppression and struggle for cultural empowerment, he paints the challenges and celebrations that he has encountered in his lifetime. Janvier credits the beadwork and birch bark basketry of his mother and other relatives as major influences. His work has been exhibited internationally – most notably as a representative in a Canadian/Chinese Cultural Exchange in 1985. In January 2004, one of Janvier’s works was displayed in Paris, France at the Canadian Forum on Cultural Enterprise. Nationally, Janvier has created several acclaimed murals; the 450 m2 Morning Star at the Canadian Museum of Civilization, is a personal career highlight. Janvier is one of Canada’s most significant, pioneering Aboriginal artists. As a founding member of the Professional Native Indian Artists Incorporated (PNIAI) – the so-called “Indian Group of Seven” he was key in challenging perceptions of Aboriginal art. His influence continues to be felt by First Nations today. Accolades include three prestigious Lifetime Achievement Awards from the National Aboriginal Achievement Foundation, The Tribal Chiefs Institute, and Cold Lake First Nations, in addition to the Order of Canada and Alberta Order of Excellence. Janvier’s passion and natural talent for creative expression remain strong to this day.